Hi all and sorry for being MIA. I blinked, and a week had gone by. I did find some time this past weekend to stamp some cards, JUST FOR FUN! :) YAY! I had purchased my daughters some cute little girl stamps from Hero Arts and decided that I would make some cards using those stamps. They remind me of Greeting Farm stamps, but in mini version. For this card, I used Paper Girl, from The Girls' Paperie. It is a new (to me) company, that I found on 2 peas, and I REALLY love the girly, vintage-y feel. I stamped the image in Memento black, colored with Copics and used an old sketch by Taylor (TECC57). The image is from a MFT stamp set, Essential Sentiments. My second card uses all the same papers and supplies... you know me... efficient stamper. While I have all the matchy matchy stuff out, you better believe I am going to crank out more than one card... try SIX. LOL I'll try to space them out so you don't get bored with my paper choice. heehee This card uses a sketch by Amy R.
These are adorable, Jody! LOVE the mix of papers! Ack! Super cute! Love that girl and the paper is fab! Can't wait to see tomorrow's post! These are so CUTE! Love that flower! Those are SUPER DUPER Cute Jody... I'm STILL looking for the burlap... I have ribbon, and it's HUGE-O but nuttin to make flowers with.... SPILL IT SISTER!!!!! 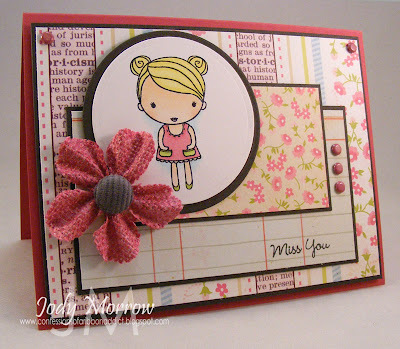 Totally adorable cards, Jody! Love the matchy matchy! Aw, these litgirls are sweet! I love the coloring and the crads are wonderful. All the layers and patterns..great cards! so sweet :) like it very much!